How to... improve an LED tealight for brightness - Updated!. 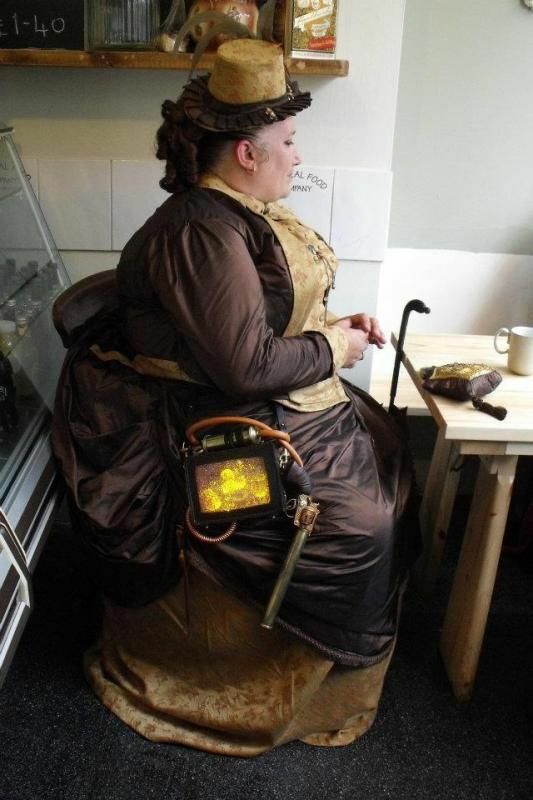 The Steampunk Forum at Brass Goggles > General Steampunk > Tactile > How To... (Moderator: von Corax) > How to... improve an LED tealight for brightness - Updated!. Nearly all the LED Tealights available cheaply, consist of nothing more than a single yellow LED, a small 3V coin cell battery (CR2032) and a plastic body roughly the same size as a real wax tealight. They are made using the *minimum* of parts, and are thus very cheap but not very "hackable". The LED is a special type that has the circuitry built into the die of the LED (the bit that makes light), thus no external circuits are needed to make it flicker. Usually the circuit is actually the chip from a musical greetings card, but instead of producing sound, it is connected to the LED which varies in brightness in responce to the 'tune' (just as a speaker vibrates in responce to the same tune). To keep costs even further down, no current limiting resistor is used, instead the circuit relies on the internal resistance of the coin cell battery to limit the power to the LED. LEDS are current driven devices. The current/voltage characteristic of an LED is similar to other diodes, in that the current is dependent exponentially on the voltage. This means that a small change in voltage can cause a large change in current. If the maximum voltage rating is exceeded by a small amount, the current rating may be exceeded by a large amount, potentially damaging or destroying the LED. The typical solution is to use constant-current power supplies, or driving the LED at a voltage much below the maximum rating. Since most common power sources (batteries, mains) are not constant-current sources, most LED fixtures must include a power converter. However, the I/V curve of nitride-based LEDs is quite steep above the knee and gives an If of a few milliamperes at a Vf of 3 V, making it possible to power a nitride-based LED from a 3 V battery such as a coin cell without the need for a current-limiting resistor. OK that's the explanation out of the way, onto the hacking. When you open a standard cheap LED tealight you will find an LED, two small wires, a switch and a coin cell battery. To make a brighter tealight you will need a better LED -brighter requires more power- , a bigger battery or "wall wart" mains adapter, a common low power transistor (eg 2n2222), and an appropriate rated resistor for the LED. The resistor value will depend on your supply voltage, the forwad voltage (Vf) of the LED (the voltage required to make it light up), and the current required for the LED to operate correctly. For this example I will use a 1Watt Luxion Star LED, and a 5v 'wall wart' USB charge adapter - mainly because 5V is an easy voltage to work with, and USB charging adapters are easy and cheap to find. The resistor values are correct for the circuit with a 1 Watt *WHITE* LED running from a 5V supply. Different LED wattages and colours will require a different resistor, as will different power supply voltages. Refer to the specs for the LED (the voltage (Vf) and current (mA) values) and use the resistor calculator in the link above. The flickering LED is connected to the +5V supply via a 56 Ohm resistor. This resistor limits the current to the flickering LED, and provides a voltage difference between 'ground' (negative side of the power supply) that can control the switching of the transistor (the "base" pin of the transistor - marked 'B' on the diagram). 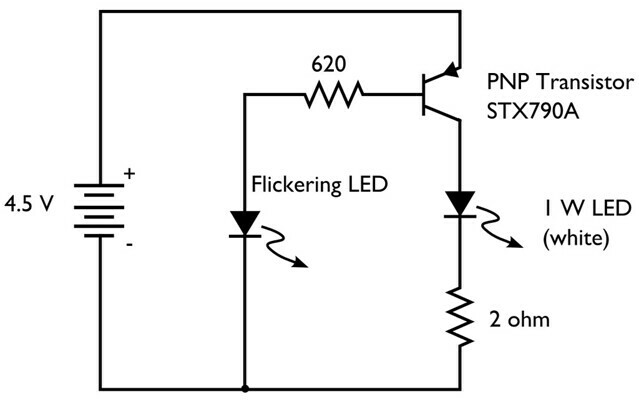 As the flickering LED changes brightness, the voltage it uses changes, and this is what controls the transistor to switch the power to the 1 Watt LED, which changes in brightness according to the flickering LED. The 1 Watt LED is connected to the +5V supply through the "emitter" ('E') pin of the transistor, and via a 4.7 Ohm resistor connected to the "collector" ('C') pin of the transistor, which limits the current the LED can pull. The transistor is a very common low cost item that can be found at nearly every electronic parts suppliers. It is able to handle up to 1 Amp of current, so will be suitable for LEDs up to 3 Watts. The NEGATIVE pin of the flickering LED can be identified by the flat spot on the base of the case - see diagram above. If you can't find the exact resistors required, just use the nearest lower value resistor. If you can't source suitable resistors at all, then you can get a suitable value by using much high rated resistors in parallel to reduce the resistance to the required value. It's a very simple circuit, and there are many ways it can be adjusted and improved. Have fun. Re: How to... improve an LED tealight for brightness. Thanks. I've already got a couple of ideas. How well do you think this'll work on the 5V from my PC's power supply? The 5V rail on a computer PSU is perfect, very well regulated with little drift in voltage. More than enough current to support a large number of high power LEDs. If required, the same circuit with the resistor values shown can be used on higher voltages just by adding a simple voltage regulator with a 5V output, such as the LM7805. This part is good for 1A of current if used with a small heatsink and given plenty of airflow, and a voltage input between 7V (min) and 25V (max). Not very efficient for battery use though, but useable. The 7805 regulator is another common low cost part. More efficient (and easier / cheaper) to just change the resistors though. Perfect. I have a wooden PC case that looks like an old radio (an nMEDIAPC HTPC 8000 ATX, if interested) . I've been trying to figure out how to add a couple of flickering lights inside that'll be visible through the "speaker grills" on the front, and this looks like just the thing. This is very handy. Earlier in the year I acquired more LEDs than the average electronics tech could use in a lifetime. & I have a nice tea light lantern just waiting to be modded! Very useful! I've got an old gas lamp that I've modified with several flickering LEDs to look like a flickering gas flame, but it's barely bright enough to create ambiance. Replacing them with a brighter (yet still flickering) LED module may be just the thing! Indeed, this is what I intend to do with the several Victorian gaslights I've been collecting. It was the reason I came up with the circuit originally. Clear silicone sealant is usually a bit opaque, and as such it works nicely to make a flame shaped diffuser if required. The conical shaped applicator tip on the tube can be used to make a mold that is roughly right shape, then when set, you can cut / add more silicone to get the exact effect you want. I attempted to build this circuit but only the tealight led would light up until I turned the voltage up well past 6V and even then it was very dim. my led shines brighter if I just put it in series with the tea light using 4.5v than in this circuit at 6.8v. Can you give me an idea why this didn't work? I don't know the exact specs of any of my led's since I salvaged them from other electronics. Sorry for late reply, only just noticed this. If you recovered the LED from any flashlight made in the last couple of years, it was likely to be at least 3W, more likely 5Watts or even more! That requires a LOT more current than the above circuit was designed to give. However adjusting the parts used for the circuit, to ones suitable for the LED, it should still work. The Transistor is able to handle a max of 800mA, so a 3Watts LED would be driving it near it's limits, better to find one capable of higher current, say about 1.5A or so. Or, especially for 5W or higher LEDs, increase the power supply to 12V and swap the transistor for a FET (MOSFET), and change the values of the two resistors to suit (using the LED calculator link provided). If I get the time, I will run up an updated version of the circuit using modern LEDs and higher power transistors / FETs etc. Clockwork Alchemy has these all over the con. We tried tea lights in these, but they were just too dim. A higher-powered version is exactly what's needed here. Preferably something that would run for several days on batteries. That circuit is very helpful. The only minor difference is that I 'tap' power from the flicker LED, rather than feed directly into the base of the transistor. But it doesn't make much difference which way you do it. Wish I'd known about that diagram in the first place (it was posted a year before mine), as I would have just used that one (I'm lazy). Yes, that's a better circuit. The STX790A can handle 3 amps. It's also worth considering having both a white LED and a yellow LED in parallel (with different resistors) to get a more candle-like look. In the circuit at the start of this thread the transistor won't turn on until voltage across the 56 ohm resistor in series with the flicker LED exceeds voltage drop across the big LED. Using an NPN transistor as a high side switch gives you difficulties like that. Keeping the same components, exchanging the 4.7ohm resistor and big LED should greatly improve lower voltage performance. In the circuit I presented a PNP transistor is used as a high side switch, and all the current through the flicker LED is used to drive the transistor. To be honest, the circuit was litterally built from random bits in my junk pile. No thought was given to practicality other than "use common / easily obtained parts", and that's what I did. OK, so you have me curious now. I will attempt to find the parts listed for my original circuit, and will see if I can get it to function as shown. It's entirely possible that I've fried too many brain cells, and the circuit above ISN'T what I actually built. I'll be changing the circuit diagram anyway, it was shown specifically for the Luxeon 1W LED, and that is no longer available. I'll use the next nearest equivalent that is still in production. Or you can just buy larger flicker LED bulbs. These are now a standard product, and fit candelabra sockets. 85-250V. Also - I'm not too trusting of won-hung-lo Chinese brand LED lights, sometimes the safety aspect can leave a lot to be desired (especially at mains voltage!). Anyhow, I have found most of the bits, managed to find a working 1W white Luxeon star LED, but I seem to be having trouble finding a 2n2222 transistor. So I may have to improvise with that, I found a bag of A92 transistors, and that can handle 500mA, so good enough for this test. I'll dig the rest of the stuff out and get this built up. Back shortly with the results. well, I finally found a npn transistor (TV vertical deflection output) and wired up the circuit as show - and I was able to replicate the issues TLROBB reported. So yeah - I dropped a bollock on this one... EVEN WHEN DIRECTLY COUPLED, the transistor is unable to sink enough current to drive the LED. However, given the fact I could not find ANY NPN small signal transistors, I'm wondering if it was a PNP (of which I have tons) that I used - in which case it would have been the circuit in the link above, that I actually built. Bugger! - I just figured out what I did wrong in the diagram (I was in bed, had to get up and check if I was right...). It's a really simple brain fart - I have the connection to the transistor WRONG. I didn't see it because it's technically right to connect that way, but not in this case. Right - will change the circuit in the original post now. Re: How to... improve an LED tealight for brightness - Updated!. The revised circuit diagram look good. Really hate to use a null login but really can't join another cool forum and lose more time I should be working! The photobucket links here are dead! Bookmarked this ages ago and bought the 2N2222 transistor and other parts but then the rest of the project I was working on failed so I never got back to it. Repairing some Halloween candelabras and pulled this back up and it's gone! It would be really great if maybe someone could restore them or post a new circuit diagram - it would be really helpful if someone could explain /how/ the resistor values were chosen (4.7 ohm makes sense for a 1W LED but choosing 56ohm for the tea light LED is a mystery to me!) and how to calculate them for different types of LEDs. Thanks in advance!